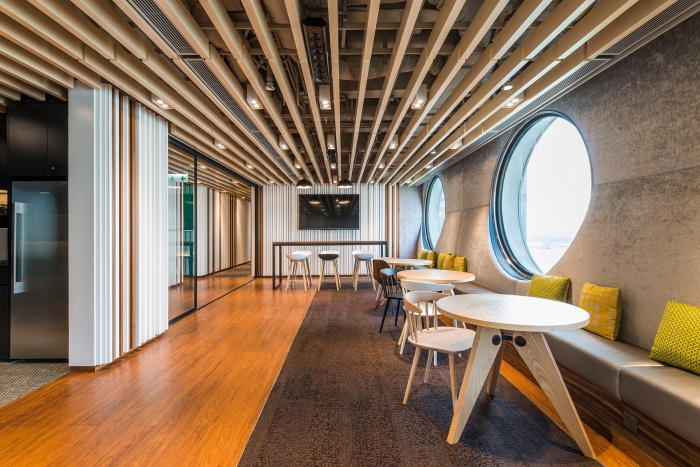 Circa ia has completed the design of global legal group Clifford Chance‘s newly renovated offices located in Hong Kong. Located for 20 years in the same building, 15 since the last fit-out, & having had a series of expansions; our client wanted to refresh, align, & update some elements of their 4 workspace floors. As a UK practice they operate a shared lawyer’s office model. We started by investigating, through a series of workshops, what the functional elements of the lawyer’s office needed to be standardized & what to vary. We concluded a common base layout, fair as possible to both occupants; with one storage solution for litigation, & one for non-litigation teams. We also recommended sit-stand desks for all staff as a both a ‘wellness at work’ direction; but also a way to get a variety of posture & settings for different staff. In order to recognize their open desk policy, we developed a sliding door solution that was both discreet when open, and also a good sound seal when closed. This formed a part of our work to increase the sound privacy for each room. It was decided each floor would move the break out area to the window line, & these were all placed off the staircase to increase opportunities for staff to meet, & to give a sense of activity within the workplace. A key feature of both the space was ensuring design was sound absorbing.